The Tip Speed Ratio (often known as the TSR) is of vital importance in the design of wind turbine generators. If the rotor of the wind turbine turns too slowly, most of the wind will pass undisturbed through the gap between the rotor blades. Alternatively if the rotor turns too quickly, the blurring blades will appear like a solid wall to the wind. Therefore, wind turbines are designed with optimal tip speed ratios to extract as much power out of the wind as possible. When a rotor blade passes through the air it leaves turbulence in its wake. If the next blade on the spinning rotor arrives at this point while the air is still turbulent, it will not be able to extract power efficiently from the wind. However if the rotor span a little more slowly the air hitting each turbine blade would no longer be turbulent. Therefore the tip speed ratio is also chosen so that the blades do not pass through too much turbulent air. The tip speed ratio is given by dividing the speed of the tips of the turbine blades by the speed of the wind – for example if a 20 mph wind is blowing on a wind turbine and the tips of its blades are rotating at 80 mph, then the tip speed ration is 80/20 = 4. The optimum tip speed ratio depends on the number of blades in the wind turbine rotor. 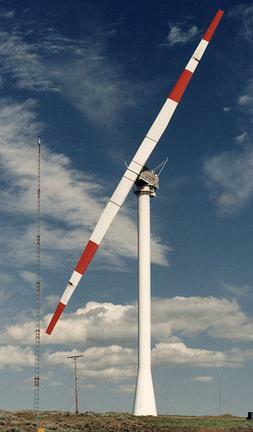 The fewer the number of blades, the faster the wind turbine rotor needs to turn to extract maximum power from the wind. A two-bladed rotor has an optimum tip speed ratio of around 6, a three-bladed rotor around 5, and a four-bladed rotor around 3. Highly efficient aerofoil rotor blade design can increase these optimum values by as much as 25-30% increasing the speed at which the rotor turns and therefore generating more power. A well designed typical three-bladed rotor would have a tip speed ratio of around 6 to 7. If the tip speed ratio is too low – for example if poorly designed rotor blades are used – the wind turbine will tend to slow and/or stall. If the tip speed ratio is too high the turbine will spin very fast through turbulent air, power will not be optimally extracted from the wind, and the wind turbine will be highly stressed and at risk of structural failure. Different types of turbine have completely different optimal TSR values – for example a Darrieus wind turbine is a vertical axis (VAWT) design with aerofoil blades which generate aerodynamic lift and therefore the TSR can be high, but a Savonius wind turbine which is also a VAWT is a drag design and so the TSR will always be less than 1 – i.e. it cannot spin faster than the wind hitting it. Pictured above is a graph showing the power coefficient for different values of tip speed ratio for a two-bladed rotor. The theoretical maximum efficiency of a wind turbine generator is given by the Betz Limit of around 59%. With a tip speed ratio (TSR) of just under 6, the power coefficient for this example turbine is 0.45 (= 45%).